It is such an interesting and fascinating shrub, that blooms almost unceasingly throughtout the year. This lovely cultivar, Crossandra infundibuliformis ‘Lutea’ or Yellow Crossandra with deep rich yellow flowers, glowing above its lustrous deep green foliage is simply stunning to say the least. They exude such warmth and sunshine all year round in our tropical garden with their burst of bright and brilliant colors. We’re thrilled that it can tolerate full sun. That at least gave us some leeway to plant this lovely bush in our outer garden plot which is blasted by the afternoon sun. Not many plants can survive in that blinding heat, there were many casualties! Plant type: A tropical flowering perennial shrub, native to Southern India, Sri Lanka and Tropical Africa. Moisture: Regular watering moderately. Do not let soil dry out between waterings and maintain relatively high humidity. One way is to let your potted plant sit atop small stones laid on a tray of water. 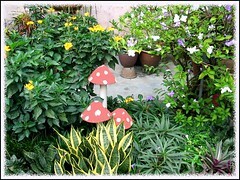 Or regular misting of their foliage is encouraged, never on their delicate blooms though. Soil: Well-drained fairly fertile soil. Preferably equal parts of loam and peat moss, plus sand for good drainage. Propagation: Propagation by tip or stem cuttings, taken when pruning plant in Spring or germination of seeds. It self-sows readily too. 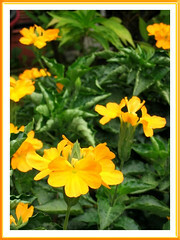 Features: Crossandra infundibuliformis is a small evergreen ornamental shrub that is relatively low. It grows to a height of 1-3 feet, depending on the cultivar and spread as wide. Firecracker Flower as commonly named, grows vigorously in the Tropics where there is abundant rain, sun and humidity. Foliage is dark green and glossy, with oval (some have ruffled) leaves, about 2-5 inches long. The flowers are unusually shaped with asymmetrical petals spreading to form a 3-5 lobed disk, arising from slender 0.75-1 inch long corolla tubes that sprout from 4-6 inch long four-sided spikes. 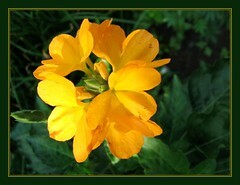 Flower colors range from the common orange to salmon-orange or apricot, coral to red, yellow and even turquoise. 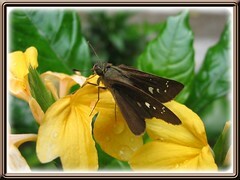 Their fragile flowers are easily damaged by rain, otherwise can be quite long-lasting. These low ornamental shrubs are generous bloomers all year round, often beginning to bloom when only a few inches tall. 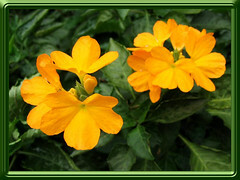 Usage: Crossandra infundibuliformis will make excellent container or tub plants for patios and decks. Popularly grown indoors as a flowering houseplant, especially the dwarf cultivar that grows not taller than 1.5 feet. Being compact and small, it would be ideal outdoors in landscape gardening or borders with a mixed crowd of annuals or perennials. Great shrub for hedges and fencing too. In India, the orange flowers of Kanakambaram or Firecraker Plant are favorites with the ladies, to adorn their hair or tied with jasmine flowers and offered in temples. 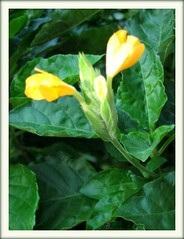 Care: Firecracker Flower is quite an easy plant to maintain. Provide sufficient water, bright light and high humidity, as well as feed fortnightly with a balanced fertilizer, half the recommended strength, and it will be a happy bloomer throughout the year. It is sturdy and a survivor, so do trim often to keep it tidy, bushy and compact. It is least bothered by pests and diseases, though do check their leaves for spider mites and white flies occasionally to prevent infestation. 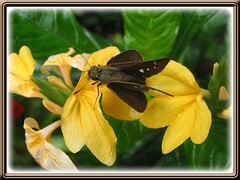 ‘Lutea’ (Yellow Crossandra) – bright deep rich yellow flowers. 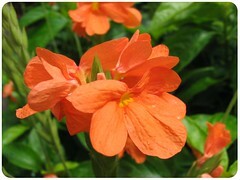 ‘Tropic Flame’ (Orange Crossandra) – bright orange-salmon flowers. ‘Nile Queen’ (Red Crossandra) – bright red flowers. ‘Shamrock’ (Green Ice Crossandra, Turquoise Crossandra) – turquoise flowers. 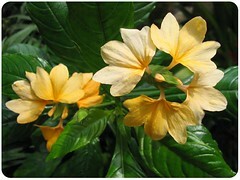 Where can I find seeds for purchase on the Crossandra. I’ve looked but cannot find. Thanks for the compliment. I am sorry though that I’m unable to answer your enquiry about the seeds. I just purchased 2 beautiful plants yesterday at Home Depot (Jacksonville, FL). 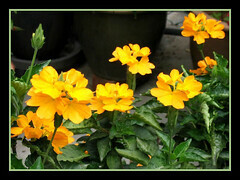 Mine are the “Orange Marmalade” crossandra. Nice pictures. I have a small plant about 3 in. how long will it take to grow big and flower? Thanks for the compliment, Sri. From our experience, this plant starts to flower even as a very young plant, less than 10″ tall and is a vigorous grower in good growing conditions. I have a large bed of crossandras that are seemingly unhappy. We have had abundant rain showers, I have fertilized with liquid MIracle Grow and with time released fertilizer and the plants are not blooming. The bloom shoots appear, but die before they flower. 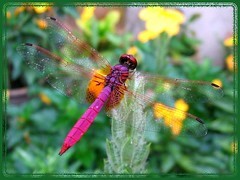 No apparent insects …. I’m baffled. Any ideas?? I live in Central Florida. Thanks. For those folks having difficulty finding this plant, I purchased mine at Trader Joe’s Market in San Jose, California. It has been blooming non-stop since I bought it in Oct. ’09. We live in zone 9 so I’m reluctant to transplant it outdoors, as our nights get down to well below 55º. It is thriving near a south-east facing window. In spring I’ll try some rooted cuttings outdoors as an experiment. Good luck and Happy New Year 2010! I also live in San Jose and am wondering whether you would be kind enough to share crossandra seeds (if you have any) or at least rooted cutting? I would like if you can share crossandra seeds or cuttings with me. Sorry, Lakshmi! We don’t do this! All the best and happy gardening, Crossandra fan! 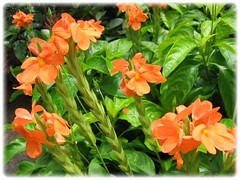 I have bought some Crossandra Plants, the Tropical Flame Some from A garden center, and some from our local market. I am wondering whether or not I should cut off the stock that the flowers bloomed along as nothing is coming from them anymore. There is another bloom on the plant which came out on a single stem – not like the previous blooms which bloomed all around a stock. Am wondering what to do with those stocks when they stop blooming. Mine is a houseplant – I live in Canada so would never put it out as it wouldn’t survive the winters. I have the same question as Dianne . I have lots of plants and hundreds of suckers from seeds but not much blooms on th e old plants.Also some of the leaves have gone pale green. Wonder if it is a disease? I live in the Caribbean. I have the same question as Maggie & Dianne. Do I cut off the stock after the flowers have bloomed? Do they sap energy from the rest of the plant once that stem has finished its blooming? How do I acquire the seeds from the buds once the flower dies? Hi Virginia! Just allow the spent flower heads to remain on the plant until they turn into brown seed pods that contain the seeds. I planted my new plants a month ago. All flowers are spent and seed have started. how do I get the plant to bloom again? Should I prune the spend flower heads or leeave on the plant for them? Kati… if you don’t intend to harvest the seeds, you can prune the spent flower heads to encourage new branches which will result in more blooms. I have found a new pest (in this area seen for the first time) feeding on the flower buds of Crossandra in Mandya district of Karnataka, INDIA. It appears to be a orange colored maggot belonging to Diptera. The incidence is almost 100% in all flowers. The symptom includes shrivelling and unfurling of flowers coupled with rotting at the base of the flower. Is there any one working on this pest for future management. I am in the Dominican Republic, the Caribbean. Several friends and myself bought Crossandra plants, large ones. They were in full flower. We were told it liked shade and was a good house plant. The flowers eventually died and the plants would not re-bloom. Then a lady from Florida told us she grew it there. Put it in full sun she said. I was apprehensive but did it. YES ! blooms non stop and in the Dominican sun too, really hot. All over the internet it says shade… don’t believe it. They florish and flower in full sun. You’re absolutely right, Dorne… this lovely shrub simply adores full sun! Thank you very much for sharing your experiences and success. Any idea where I can find ‘Lutea’ (Yellow Crossandra) and the Red one. unable to find them online.